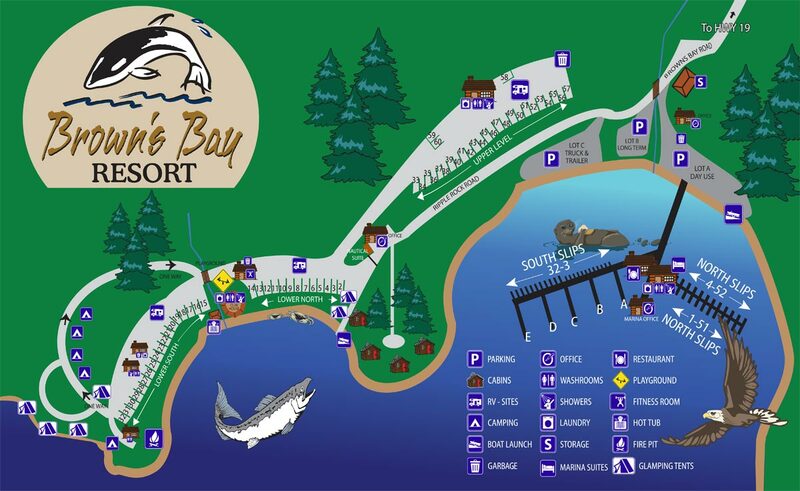 Brown’s Bay Resort’s oceanfront cabins on Vancouver Island, BC, are luxurious and picturesque while providing visitors with a personalized theme for each different premium cabin. 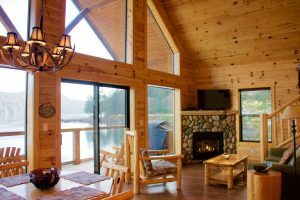 Located just a stone’s throw away from the Pacific Ocean, these vacation cabins offer you views of the Inside Passage, which is filled with wildlife and marine traffic bound for Alaska. 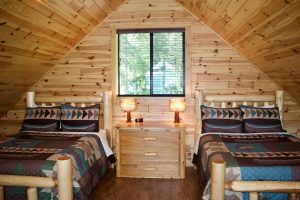 All of the luxury cabins on our resort are equipped with a full kitchen, living room with gas fireplace, downstairs bedroom with a queen-sized bed, washroom with shower and tub combo, second bedroom upstairs, and a large oceanfront deck with BBQ. 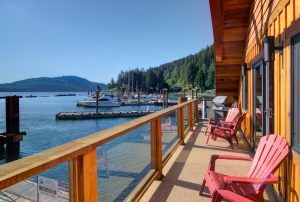 The wall of windows facing the ocean offers fantastic views that give you the opportunity to sit and relax in our custom log furniture and watch the world go by at a leisurely rate. 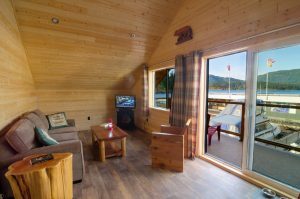 The Bear Cabin – Being the middle cabin, your views are aimed right at the open water towards Quadra Island. This gives you a 180-degree view both up and down the Straight. There is a queen bed in the lower private bedroom and two doubles in the loft. The Deer Cabin – This cabin view is towards the south and the Seymour Narrows – where the largest non-nuclear explosion blasted away the infamous Ripple Rock in 1958. There is a queen bed in the lower private bedroom and two twins in the loft. The Fish Cabin – Looking in the direction of the marina and the fishing grounds, this cabin was furnished with the fisherman in mind. There is a queen bed in the lower private bedroom and two doubles in the loft. 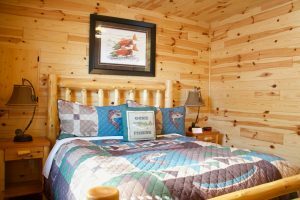 The Wolf Cabin – This new cabin brings much of what our customers have loved about our other premium cabins while including an additional upstairs bathroom at a slightly increased rate. The Nautical Suite – This suite is the perfect place to relax. 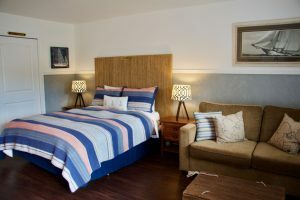 This bachelor pad-style room has a full kitchen, four-piece bathroom, a queen bed, and a cozy sofa bed as well as an electric fireplace and an oceanview deck looking out towards the RV park. Outdoor enthusiasts can try a new way of camping! There are two different types of glamping tents available for individuals looking to relax on our campgrounds. The deluxe, luxury oceanfront tents are fully-equipped with everything you need. The four person tent has two queen beds and dividers while our six person tent has a queen and two bunk beds. They are also equipped with a full, three-piece bathroom with hot water, linens, and towels provided. The living room section has a large dining room table and a kitchen with two burner hotplates, a coffeemaker toaster, kettle, and a fridge with a freezer. The front living section can open up all the way to create an even larger indoor/outdoor living space and the deck is fully covered and features a BBQ and lounge set for those beautiful summer nights. Situated on the waterfront, these deluxe tents have stunning ocean views. 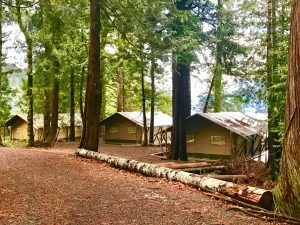 Our cliff side tents, on the other hand, are for individuals looking for a more rustic camping experience. These tents only come with power but have easy access to a nearby-shared bathroom and shower building. On the outside of the building is a large sink for washing-up and doing dishes. This is the perfect option for people who want a more authentic camping experience, but still want to be able to enjoy some modern comforts. Kitchen essentials, bedding, linens and towels provided. These suites located in the marina are new in 2016 and fully equipped with one queen bedroom, full private bath with tub/shower combo and full kitchen. They also have balconies with a BBQ and seating area. If you have ever wanted to stay in a floating suite and bob along with the ocean’s currents, then this is a great opportunity for you. One of our marina suites faces the ocean to watch the marine traffic go by while the other one faces land where you have the best seat in the house overlooking the fish cleaning station and the busy marina activities. Two additional Private bedrooms are located on the main floor. 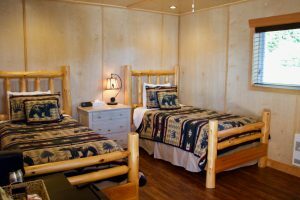 Each room has two twin log beds, mini fridge and coffee maker. Shared washroom facilities are located across the hall.